I’ve been looking forward to today for so many months. To kick off New York Fashion Week in style, some of my favorite natural beauty brands are coming together to celebrate real beauty in downtown Manhattan tonight. Major props to La Bella Figura for organizing this event all the way from Chicago. I encourage you to tweet a special “thank you” to Victoria and Karen for spearheading this effort to unite beautiful brands during one of the craziest weeks of the year — no small task! If you find yourself around the Flatiron District tonight with nothing to do, please do pop in and say hello to everyone! You will leave feeling more beautiful than when you arrived. 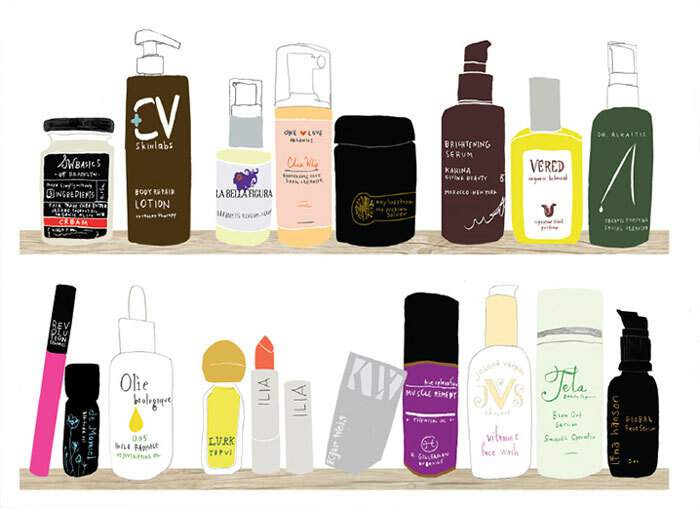 La Bella Figura cofounder Victoria Fantauzzi is your go-to girl for a mixture of homemade beauty products and vitamins should you find yourself needing a boost! Die-hard argan oil fan? Kahina Giving Beauty’s Katharine L’Heureux can probably school you a bit more in the power of this miracle oil. Skin chef May Lindstrom will likely debut a new product tonight (you saw it here first! ), and if we’re lucky, we may get to meet sweet Talia tonight, too. S.W. Basics of Brooklyn (aka Sprout Skincare) has one of the coolest founders, Adina Grigore. She’s a no-frills, back to basics kind of girl who tells it like it is. One Love Organics founder Suzanne LeRoux doesn’t like to get watered down with inefficiencies. Keep the pressed juice coming for Suzanne! Got a copy of Eco-Beautiful? Bring it to the event and maybe beautiful Lina Hanson will sign it for you! If Olie Biologique founder Linda Alixe Thompson isn’t there in person tonight, her feisty social media team better be! Her brand has one of the most upbeat personalities on Twitter. Bring your A-game and Mophies. One of my best friends, Gina, and I will be sipping fresh organic juice (and perhaps organic wine!) while we connect with the green beauty community and the fabulous founders behind today’s most luxurious, healthy skincare and makeup brands. I hope to see you there! Will you be at A Night for Green Beauty (#GreenBeautyNYFW)? What are you most excited about this season? Tell me in the comments, and please do tweet me @kimberlyloc if you’re in NYC — I’m here until Sunday!